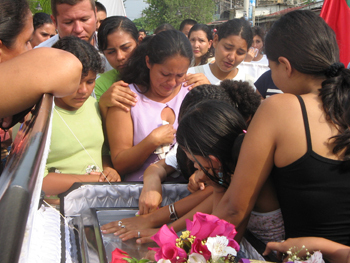 At 3 a.m. on June 14, 2007 several assailants broke through a skylight and into the Bogota Mennonite Church office of Justapaz: the Christian Center for Justice, Peace, and Nonviolent Action. Upon entering, they disabled the security and surveillance system and proceeded to steal two of Justapazâ€™s thirteen computers. The computers stolen were the two containing the most sensitive information including documented cases of political violence and churches active in courageous social justice work. They also held information on Justapaz staff, including Janna Hunter Bowman (Documentation and Advocacy Coordinator of Justapaz) and individuals connected with their documentation project entitled, â€œA Prophetic Call: Colombian Protestant Churches Document Their Suffering and Their Hope.â€ Later that day, after making phone calls to colleagues in both the United States and Colombia in order to coordinate emergency response between Bogota and Washington, D.C., a troubled yet remarkably calm Janna Hunter Bowman sat down with me to talk about her work and her life in Colombia. Janna immediately explained that this robbery was just one in a series of politically motivated break-ins of human rights organizations that will not likely be fully investigated. It is not in the best interest of Colombiaâ€™s government to do so. 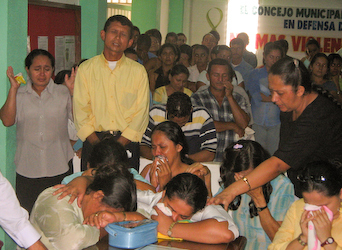 With tears in her eyes, Janna noted the increased danger that people connected to Justapaz now face, as well as the reaffirmation of Justapazâ€™s conviction to follow Christâ€™s example of non-violence, calling for repentance, and seeking a just peace through contributing to conflict transformation in Colombia. Justapaz is a 17-year-old peace ministry of the Mennonite Church of Colombia that â€œcontributes to a culture of respect for human dignity and peacebuildingâ€ in Colombia. Justapaz has eight full-time staff who work with a wide range of conflict transformation initiatives at local, regional, national, and international levels. These initiatives include conscientious objection, conflict mediation, peace training and education, the development of a network of peace churches, and a documentation project and national and international advocacy. The bill, titled â€œPlan Colombia,â€ was passed later that year. While the bill was officially intended to help Colombia put an end to the narcotics market and stop the internal war, it gave over 80% of the total $3.3 billion proposed in aid to military forces. As a result, the conflict between guerrilla entities and the government, its army, and paramilitaries, has been heightened. As civilians are caught in the middle of the conflict and victimized by all sides, churches are among those targeted. As churches help those around them, they are often perceived as challenging those in power. For example, if a church is giving aid to a victim, they may be seen as challenging the perpetrator. â€œAs we amplify voices of the victims, we are targeted,â€ explains Janna, referring to the attack on the Justapaz office. In 2001 Janna left the United States to go to Colombia. She humorously recalled that she really did not understand anything about Colombia or even speak the language very well, but felt an â€œundeniable sense of needing to be there.â€ Her first tasks in Columbia included starting a sister church program and working on international education, including sending action alerts and creating delegations. Janna returned to the United States in 2004. The joint Justapaz and Evangelical Council of Churches documentation project is largely run by 30-35 volunteers across five regions in Colombia. Each region has a volunteer coordinator and a team of trained volunteers who document their own communities. These volunteers are pastors, teachers, housewives, lawyers, banana vendors, and other everyday people who risk their safety to record the human rights infractions in their country. Justapazâ€™s documentation volunteer training program includes a look at the biblical models for recording life stories, the scriptureâ€™s perspective on the value of human life, and Christian responses to the suffering of Godâ€™s children in times of war. The program also addresses issues of fear, what it takes to do proper documentation, and what permissions are necessary in order to record and then tell someoneâ€™s story. Janna explained that the program she coordinates not only documents and denounces violence, but also announces hope through reporting on social restoration and peacebuilding initiatives carried out by local churches amidst the violence. â€œIt is incredibly humbling and a sacred privilege to be able to accompany these faithful servants as they live out sacrificial obedience joyfully, even when it means risking their own lives,â€ she said. As we wrapped up our interview, Janna talked about her hopes for support from the congregations of Franconia Conference. She suggested that a simple way to support our Colombian brothers and sisters would be to read, â€œA Prophetic Call: Colombian Protestant Churches Document Their Suffering and Their Hope (available at mcc.org),â€ and pray for the victims, perpetrators, and peacemakers. â€œI invite churches to listen to their stories and consider the Colombian faithfulness as a part of their own, intertwined through faith and policies.â€ Janna also extended an invitation for people to visit her and her husband Jess, who is a Regional Director for Witness for Peace, in Colombia. Janna returned for a third time to Colombia on June 15, 2007 after a two week break she had taken in order to take a course at Eastern Mennonite Universityâ€™s Summer Peace-building Institute and visit with family in Southeastern Pennsylvania. Janna plans to finish her term in Colombia through Mennonite Central Committee in 2009. Upon her return, Janna hopes to attend seminary and focus on peace studies.